You will only receive emergency or last minute messages/reminders from the Basileus as necessary. Any responses to the text will be sent to the Basileus only. Listed below is a direct link to the 1908 Playground Mobilization Day survey. Please complete this survey on or before Monday, June 26th. It is important that we meet YOUR needs with our programs and activities as well as meeting the needs of our community. Your opinion matters! REMINDER: Officer and committee proposed budgets for 2018 are due no later than July 1, 2017. CORRECTION: The meeting to discuss the proposed budget will be on September 7th and not on September 4th as previously announced. The place will be announced as soon as confirmation is received. 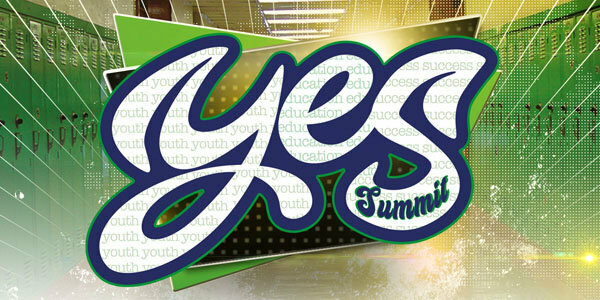 TIME: 7:00pm – 8:00pm and the conference bridge will not be available. Each committee is asked to submit the budget that reflects the consensus of the committee members and not a budget that reflects the ideas/wants/needs, etc., of the chairman of the committee. Committee chairmen are asked to let chapter members know the meeting during which the proposed 2018 committee budget will be discussed. This will allow Sorors who are interested to attend that meeting. The Chapter Development Guide and the approved 2017 XTO Budget are attached for your convenience. Please contact me if you have questions or if you need clarification as to what is expected during the budget process. Thank you in advance for your part in helping to ensure that XTO will continue to operate efficiently. Alpha Kappa Alpha Sorority, Inc. Xi Theta Omega Chapter recognizes local community members who have made significant, demonstrable contributions to the public good through public service. There are five community categories: (1) Media Award; (2) Woman of the Year Award; (3) African American Business Leader of Excellence Award; (4) African American Educator of Excellence Award; (5) Community Connections Partner of the Year Award. 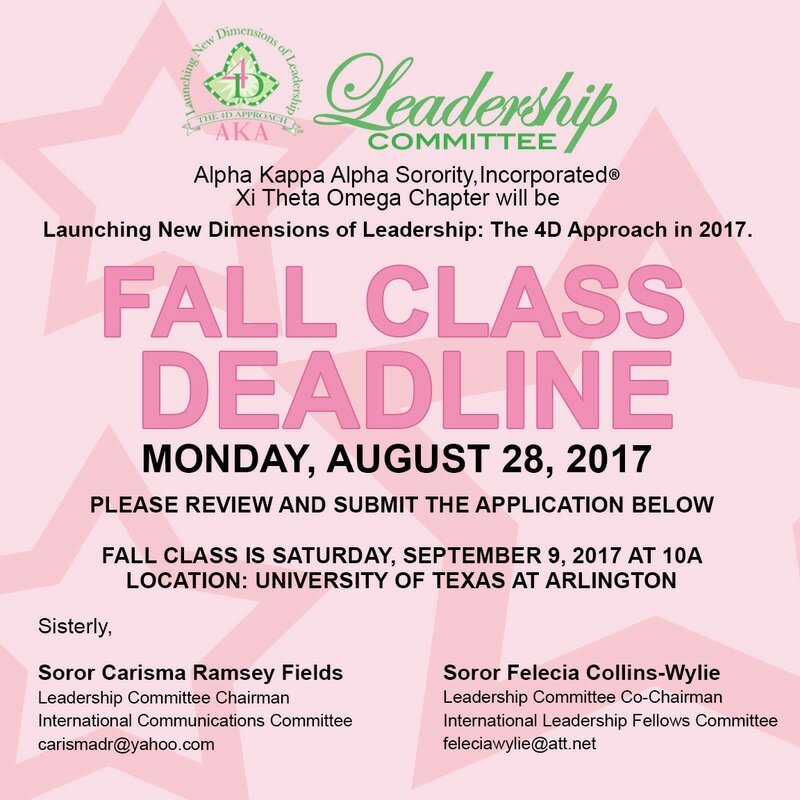 The Media Award is given to a person in the media – Newspaper, Radio, Television, and Internet – who has been instrumental in promoting Alpha Kappa Alpha Sorority, Incorporated and/or promoting a positive image of African Americans in the community. The Woman of the Year Award is a recognition given to a woman who promotes a positive image of the African American Woman. Through her leadership, her influence, and her service to the community, she serves as a role model. She either resides in the Arlington community or her leadership provides a direct benefit to the Arlington African American community. The African American Educator of Excellence Award is a recognition given to an Educator who promotes college and career readiness, demonstrates a positive image among students, and uses his/her leadership, influence, and service to the community to inspire students to further their education. This Educator goes beyond the school walls to assist students in their pursuit of lifelong learning. The Educator must service students in either the Arlington area or surrounding communities. Dr. Michael A. Evans, Sr. The Community Connections Partner of the Year Award is a recognition given to a Community Organization or Individual who helps to connect and promote Xi Theta Omega Chapter of Alpha Kappa Alpha Sorority, Incorporated with resources, publicity, and/or exposure regarding the chapter’s Program of service to Arlington, Texas and surrounding communities. This Community Connections Partner has supported Xi Theta Omega with financial, In-Kind, Sponsorships, or Partnership donations to further exalt XTO Program initiatives. Calling all Sorors to the "Step Floor” we have some but we need a few more! If you're interested in joining the award winning XTO Platinum Pearl Steppers or just coming for a little exercise, please contact the Step Steam Captain, Soror Symphony at 214-734-1750. Beginning in October we will have weekly practices. The day and times will be determined closer to October. Please note, we will perform at the 2018 Regional Conference in Albuquerque, New Mexico and the 2018 Houston and Dallas Alumni Greek Step Shows. 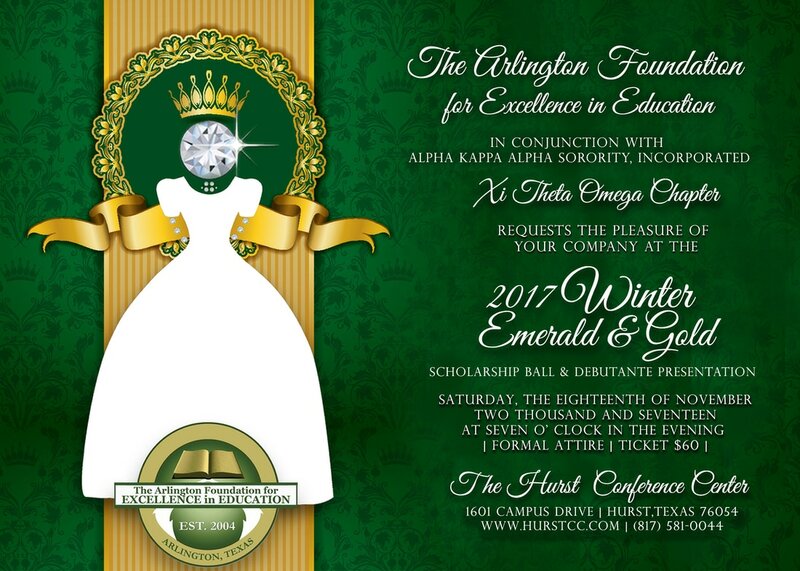 You have already been assessed for your 2017 Scholarship Ball and Debutante Presentation ticket. If you already know that you will or will not be attending, please take a moment to RSVP! If you are donating your ticket, please indicate the recipient. If you have guests that you will be inviting and need to buy tickets for, you can RSVP for them separately closer to the date. At this time, we are focusing on members RSVPing! Thanks! 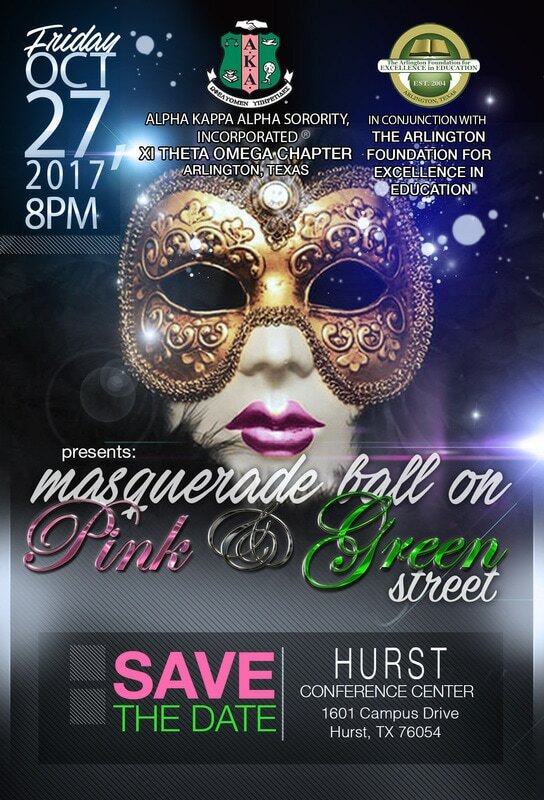 Alpha Kappa Alpha Sorority, Incorporated® is not responsible for the design nor content of these web pages. They are the sole property and responsibility of Xi Theta Omega Chapter who hosts and maintains this website.